Why would a special collection house four separate copies of the same title, all dated 1934? Thanks to the diligent bibliographical work of Paul A. Johnsgard, four separate issues of A Field Guide to the Birds: Giving Field Marks of All Species Found in Eastern North America have been identified (although he employs the descriptive bibliographical term “state” which more properly refers to changes made before release of a publication; link and here). The Smithsonian Libraries has three of the four issues: two of the valuable first, one of the third and the other of the fourth. All were released within a five-year period. These volumes and later editions attest to the printing history of Peterson’s seminal work and its immediate, overwhelming popularity, as well as to the significance of changes made to the text over the decades. 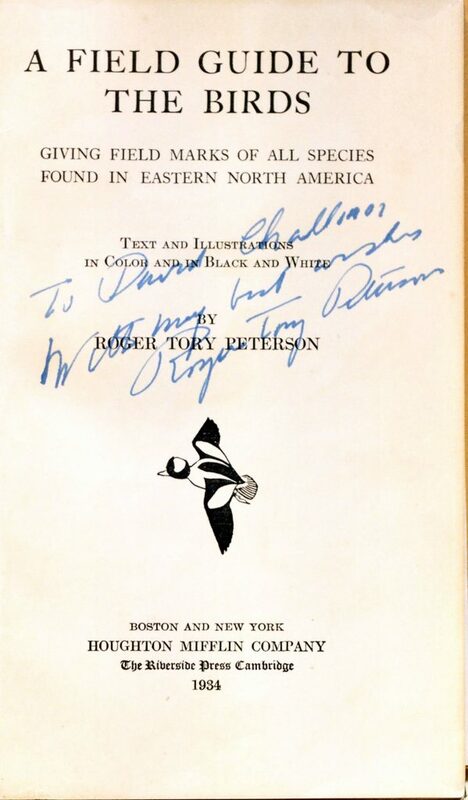 And three of the Cullman Library’s copies (link) have interesting provenance evidence, connecting Smithsonian history with the ground-breaking author, Roger Tory Peterson (1908-1996). As detailed by Dr. Johnsgard, the first issue has “1934” appearing in the title page imprint and, in the index, “bog-pumper” is misspelled “bob-pumper.” This common name of the American Bittern was corrected for the second issue. The illustrations for the Whistling Swan and White Egret have gray, “dirty” plumages in both the first and second issues, and the four color plates have tissue guards with descriptive letterpress. The third and fourth have “clean” feathers for these birds, with the final issue lacking the guard sheets to the separate plates. The second, third and fourth variants have no date on the title page but only the copyright year of 1934 on the verso of the title page. As with birding, see how carefully one must look for visual clues in bibliographical description? Once the distinguishing marks are known, identification is readily made. After being rejected by at least four publishers, Peterson found a sympathetic editor at Houghton Mifflin Company in Boston who just also happened to be the head of the Massachusetts Audubon Society. Still, the firm was cautious and had only 2,000 copies printed on April 27th, 1934, believing there were limited potential buyers. The new release sold for $2.75 and Peterson received no royalty on the first 1,000. Within two weeks, the entire run had sold out. A Field Guide to the Birds was so popular because of its simple approach. Rather than full descriptions of species, it focused on field marks and schematic illustrations by the author, who was also an artist. Inventively, he provided clear visual clues to differentiate between types. Peterson concentrated on key points, and employed arrows in the pictures for distinctive features. 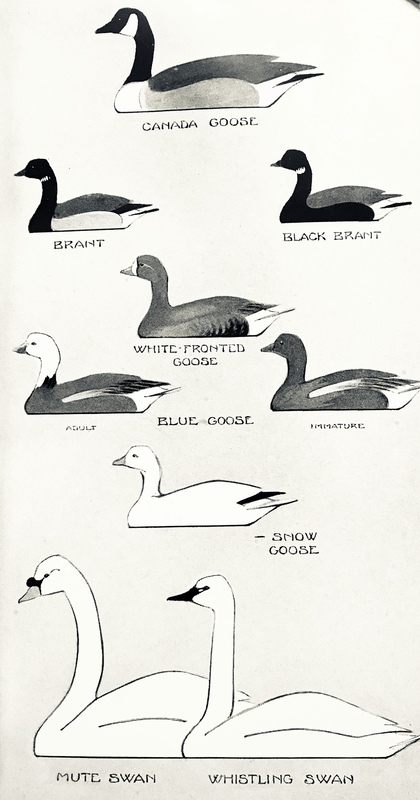 Similar classes were grouped together on one illustrative plate or page, with birds portrayed in the same positions unless a difference in stance was significant for recognition. Both the drawings and text described what a birder would notice from a distance, not close-at-hand. Being truly a field guide, small enough to be transported in a pocket or backpack and relatively inexpensive (the country was just beginning to get out of the depths of the Depression), it filled a now obvious need for the birding crowd. Those massive Audubon or Catesby folios are best left in the library! Contributing to the current scarcity of the first printing is that the Field Guide was most often consulted out-of-doors, in rain and sunshine, and scribbled in. Well-loved, it was used until needing to be replaced by a new edition. The four issues of the first edition all have the same case binding: green pebbled-grain cloth, with the simple decoration of an image of a bufflehead (the smallest diving sea duck) flying below the title, stamped in silver. The original dust-jacket is exceedingly rare to find on any of these printings; all are lacking in the Smithsonian copies. Judging from the signed copies in the Cullman Library and those in the rare book trade, the author, only 26 years old at the time of publication, personally presented most of the copies of these early printings or signed them at a later date for the owner. One Smithsonian copy of the first issue is inscribed on the front free endpaper, “To Mrs. Carll Tucker, with the compliments of the author, Roger T. Peterson.” Tucked in this volume is a letter on National Audubon Society stationery by the author (he spent ten years in New York City as the Society’s education director) to Tucker and her husband. The letter is undated and discusses an upcoming meeting of the American Ornithologists’ Union in Denver. Marcia Brady Tucker (1884-1976), largely unheralded as a prominent book collector, donated hundreds of volumes from her natural history library to the Smithsonian. Tucker grew up in immense wealth as the daughter of one of the richest men in America, Anthony N. Brady, a founder of the Consolidated Edison and Union Carbide Companies. She was a prominent amateur ornithologist who supported many related causes, including publications such as the American Ornithologists’ Union’s Ornithological Monographs series. Tucker was a board member of the National Audubon Society and the International Council for Bird Preservation (now known as BirdLife International; Smithsonian Secretary S. Dillon Ripley was that organization’s third president). Her mansion on the Upper East Side of New York City hosted many an ornithologist and birding events. There is further significance in this Tucker association copy of A Field Guide to the Birds in the Cullman Library. The Tuckers, and fortunate ornithologically inclined guests including Peterson, sailed the world on birding expeditions on their jaw-droppingly beautiful yacht, The Migrant. Peterson wrote: “Birds have wings; they’re free; they can fly where they want when they want. They have the kind of mobility many people envy.” That wasn’t much of an issue for the Tuckers. 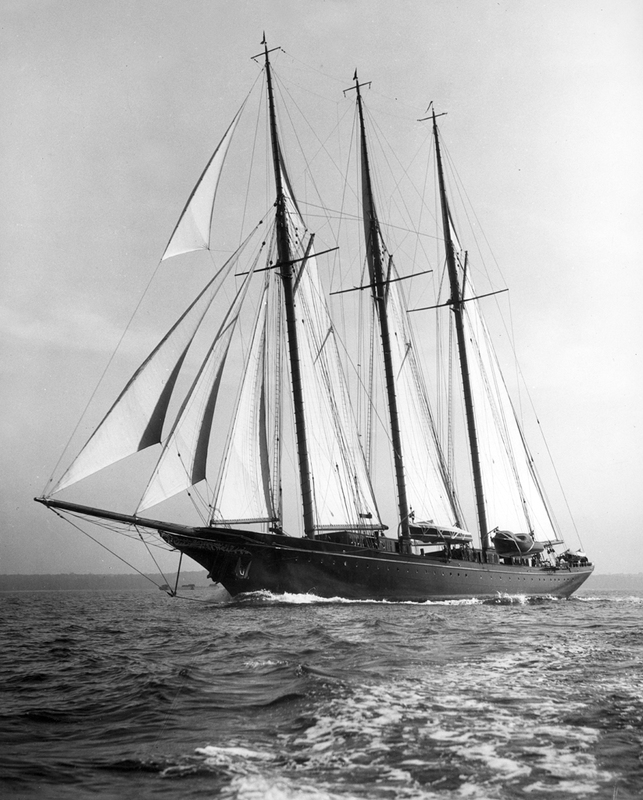 The three-masted Migrant, with an overall length of 223 feet, was considered the largest schooner-yacht in the world when she was built in Boston, Massachusetts, in 1929. Manned by a crew of thirty-four, she carried a huge amount of sails, supported by a 950-horse power diesel engine. In addition to life boats, The Migrant carried two auxiliary launches for short excursions. Not incidentally, the beautiful appointments included several English oak cupboards for books. 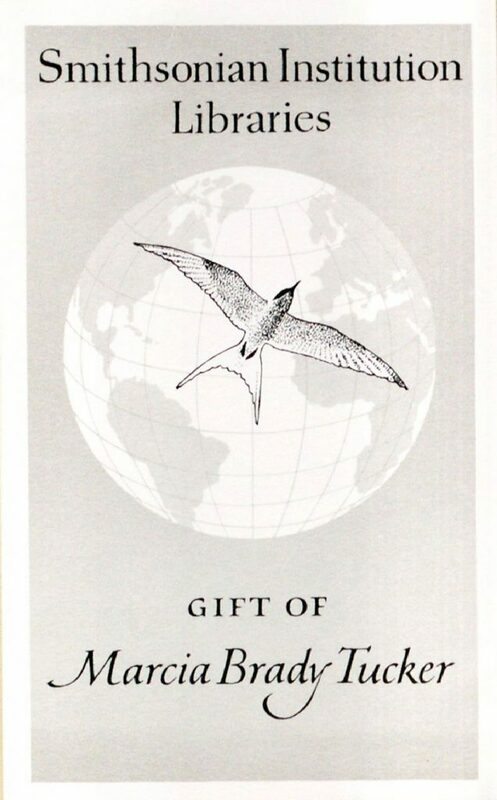 The Smithsonian Libraries bookplate for the Marcia Brady Tucker Collection has as its emblem an Arctic tern (Sterna paradisaea) soaring above a globe. This species has the longest migration pattern known, over 44,000 miles, with a circumpolar breeding distribution. The bookplate image was originally designed for The Migrant by our hero here, Roger Tory Peterson. Like the bird, the sailing ship, graceful and buoyant, glided the world. 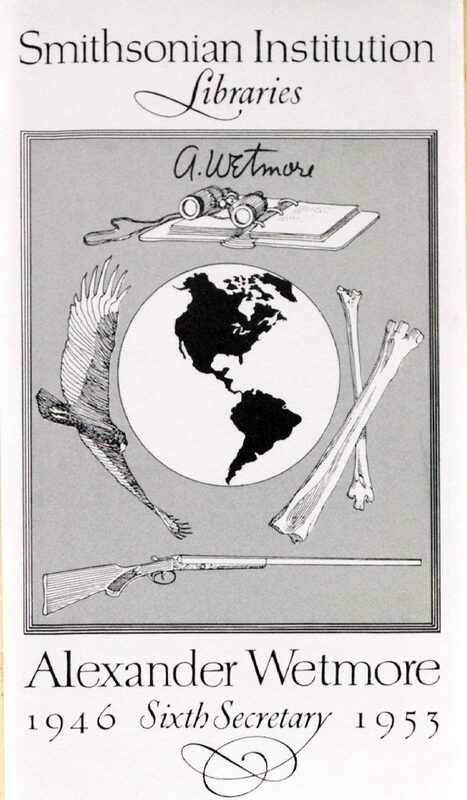 The other first edition, first issue of Peterson’s book in the Cullman belonged to David Challinor, Jr. (1920-2008), a conservationist like Marcia Brady Tucker. Recruited by Secretary Ripley, Challinor rose to become Assistant Secretary of Science, then of Research, at the Smithsonian. The penciled notations indicate that this was his book at St. Paul’s School in Concord, New Hampshire. Written in blue ink over the title, possibly at a later date, is “To David Challinor with my best wishes, Roger Tory Peterson.” Challinor served as Scientist Emeritus of the National Zoological Park until his death. Copies of A Field Guide to the Birds often contain a former owner’s notes and bird lists, as in the Smithsonian’s copies. 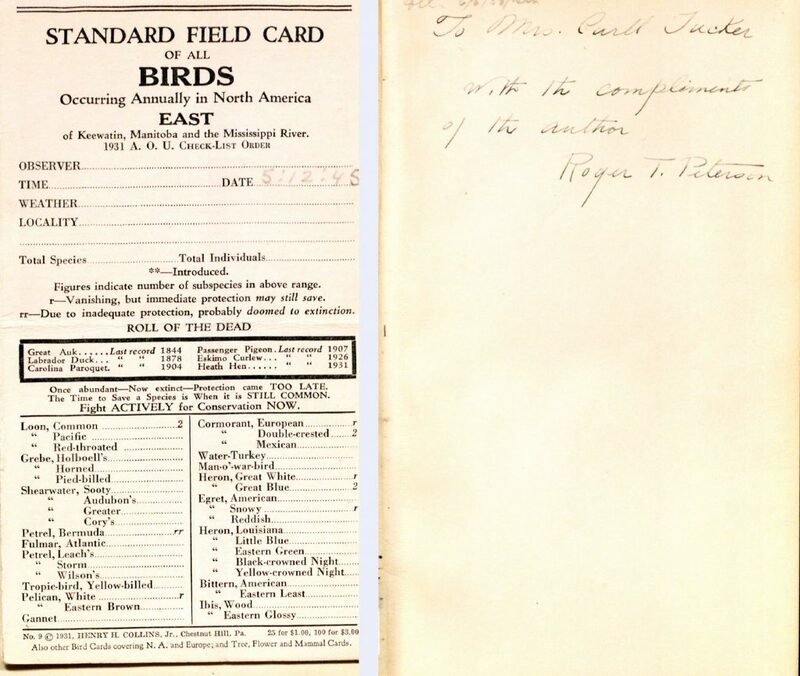 Marcia Brady Tucker’s book has penciled marks to a “Standard field card of all birds” tucked in the back. 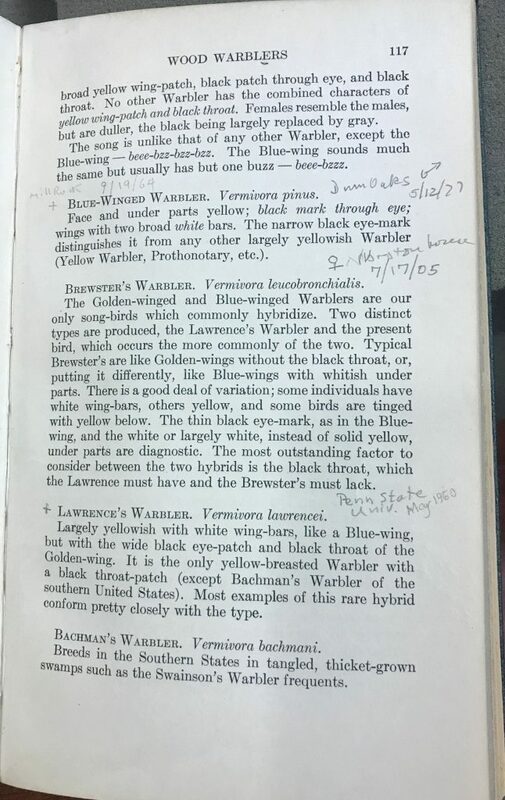 Challinor’s book has his notations and drawings as well as a manuscript list of “Noroton [Connecticut] birds in 30’s”. Such information can be of research value to ornithologists studying changing ranges and habits of a species and environmental health. 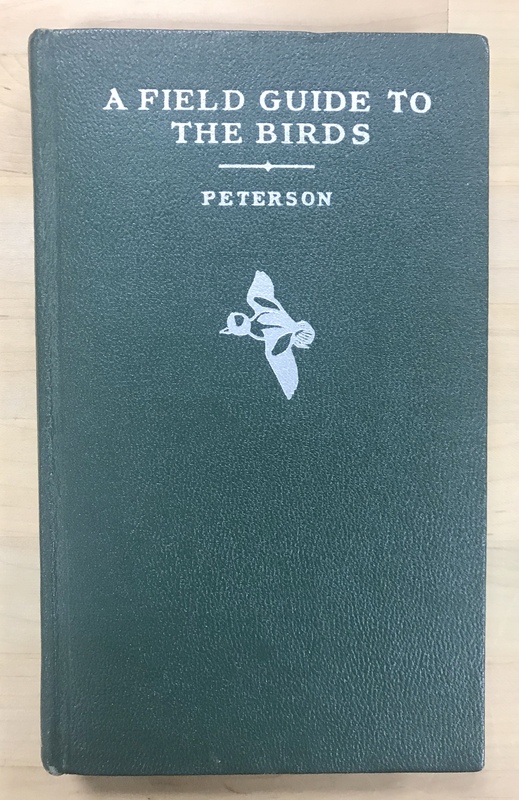 The third issue of A Field Guide to the Birds now in the Cullman Library is inscribed by Peterson “To Dr. Wetmore.” Alexander Wetmore (1886-1978) was an ornithologist and avian paleontologist who served as Sixth Secretary (1946-1953) of the Smithsonian. Wetmore’s 3,000-volume library was donated to the Smithsonian Libraries in 1979. Peterson was one of the contributors to Wetmore’s book, Water, Prey, and Game Birds of North America (1965). There is a box of correspondence, beginning in 1943, between the two in the Smithsonian Archives. Peterson spent the years 1942 to 1953 in Washington, teaching, lecturing and writing, among growing conservation activism work. The publishing market being what it is, competitors soon flocked to release rivals to A Field Guide to the Birds. But Peterson’s title has remained in print all these years from the first edition in 1934. At the 50th anniversary of publication, three million copies of A Field Guide to the Birds had been distributed. To commemorate that occasion, the Smithsonian opened an exhibition in the National Museum of Natural History on April 27, 1984: Roger Tory Peterson at the Smithsonian (catalog record here). 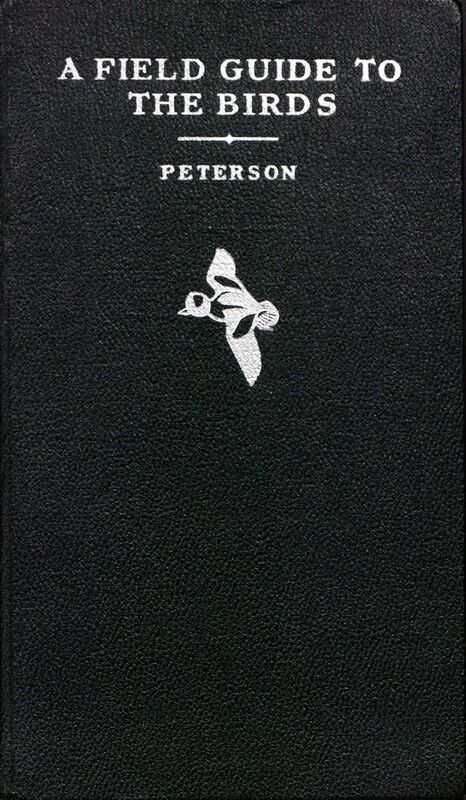 Peterson by then had written or edited many other specialized birding guides as well as handbooks to identify other natural history subjects, while remaining loyal to the publishing house of Houghton Mifflin. Titles include A Field Guide to Wildflowers of Northeastern and North-Central North America, A Field Guide to the Birds of Britain and Europe, and Birds of Newfoundland. Starting with the first work, these resources contributed to the nascent environmentalism, appealing to a wide audience and allowing scientists and amateurs to speak the same language. 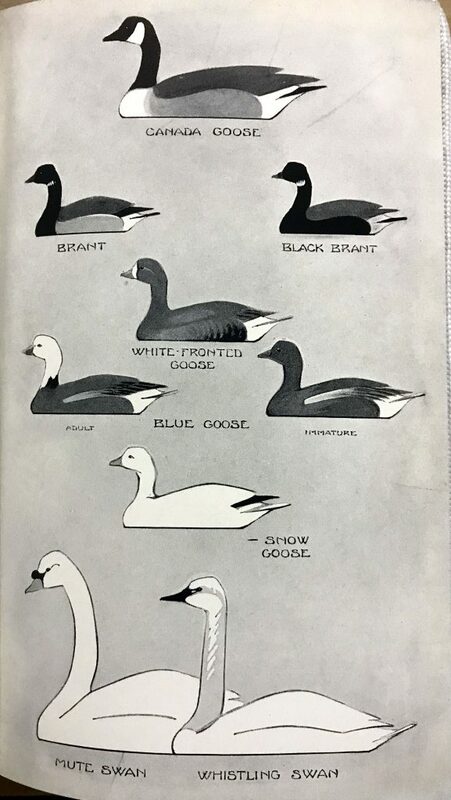 The publishing evolution of A Field Guide to the Birds can be furthered explored in the Smithsonian Libraries collections, with imprints of 1939, 1947, 1980, and 2002. While some copies are now pricey in the book trade, the real value of all these editions on our shelves is their usefulness in helping to track changing scientific views and species distribution, as well as testifying to the growing conservation movement in the first half of the 20th century. Birding by the book is of course now being overtaken by online databases and apps, which have the advantage of offering recorded sounds along with images to aid in identification. But Peterson anticipated this with the revised 1947 Field Guide, which was keyed with a set of phonograph records of bird songs that were available separately. The significant revision of 1980, with updated English and scientific names, the illustrations, and distribution maps, added tape cassettes. On this 50th anniversary of the year when ornithologist Ripley established a formal system of libraries at the Smithsonian, a commemoration of the physical books is called for. And what better book to salute this anniversary and Secretary Ripley with than Peterson’s guide? The importance of Marcia Brady Tucker’s collection, along with others, is being recognized also in the Libraries’ current exhibition celebrating its founding, Magnificent Obsessions. A Field Guide to the Birds links the collecting habits and interests of past Smithsonian notables with 20th century United States history and important publishing trends, as well as the evolution of both scientific thought and non-specialist interests. Peterson’s work directly led to the now fully accepted realization that birds are an indicator of environmental health. This is all a rich legacy from a small book that was revolutionary because of its clear expression in both the printed word and illustrative descriptions of North American birds. 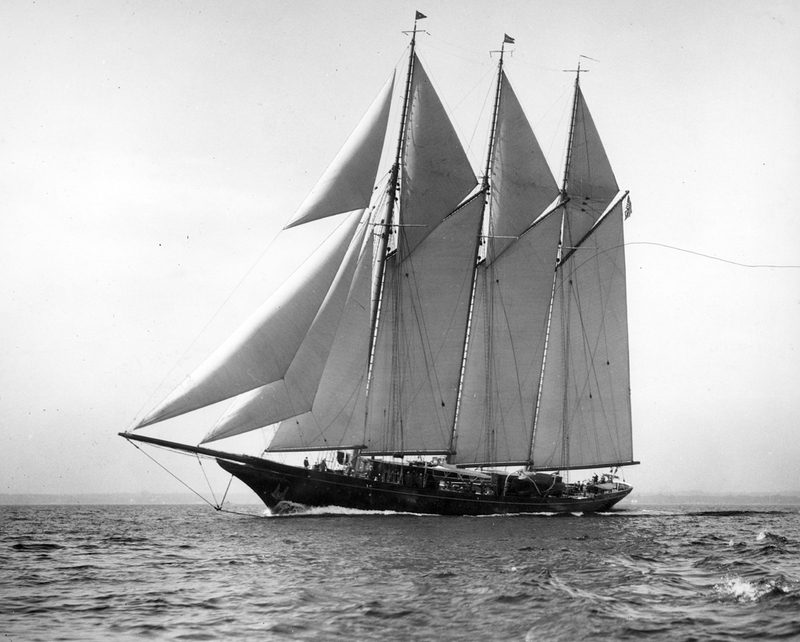 Auxiliary Schooner Migrant, 1929 (Edwin Levick photograph courtesy of The Mariners’ Museum and Park, Newport News, Virginia). The Washington Post reported on May 6, 1930 that the yacht had dropped anchor in the Potomac and the Tuckers were entertaining various groups of Washingtonians. One likes to think of them visiting the Smithsonian then. Awesome story!!! Fascinating details about the different editions. Really well done; thanks for this! Thank you for responding, Rick. It is appreciated! I obtained a first edition, first state by chance recently. I love the book (I am an avid bird watcher and when I was an undergraduate 30 years ago I worked in the university library and often worked in Special Collections), but I feel it needs to be in a collection. Do you have a suggestion as to who I should contact? Thanks! Congratulations DR! That is a find. If you would like to contact me via email and tell me where you are located, we can take it from there.